The combination of ground observations with satellite data improves the understanding of cloud processes. 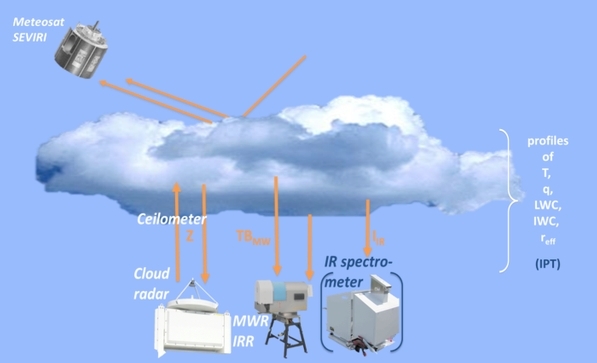 Determine the temporal evolution (history) of the air mass which transports the cloud observed by ground-based observations as a new parameter in cloud observation. Assess the spatial representativeness of ground-based column observations (upscaling). Further, our aim is to investigate the accuracy of current satellite retrievals by contrasting the key quantities with those obtained from ground-site. Therefore an optimal estimation tool has been developed to retrieve the cloud droplet number concentration as well as the liquid water content profile based on the radar reflectivity profile and the liquid water path. These make it possible to compare the retrieved quantities from ground with the satellite perspective and to improve the general assumption of adiabatic cloud profiles.